The thing about research is you never know what you’re going to find. Study inevitably leads to insight, experiments to realization. 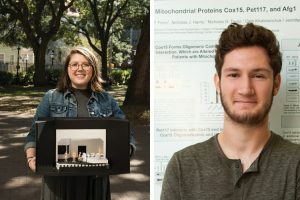 When we research, we open up the possibility for all kinds of discovery – and, for the recipients of the College’s Summer Undergraduate Research with Faculty (SURF) grant, it’s what they discover about themselves that is most unexpected. That was the case for theatre major Carrie Ferrelli and biochemistry major Mason Huebsch, who undertook ambitious research projects this past summer through funding from the Office of Undergraduate Research and Creative Activities’ SURF grant program. Huebsch also found that the research process reaffirmed his career aspirations and that he’s on the right track. The SURF program is designed to offer students a chance to explore a subject of their choosing, and give them the opportunity to run with it. “The SURF grant is an immersive experience that gives students 10–12 weeks over the summer to dedicate to their research without any kind of outside distractions,” says Elizabeth Meyer-Bernstein, associate dean of the Honors College, associate professor of biology and director of the College’s Undergraduate Research and Creative Activities (URCA) program, which provides competitive grants like the SURF grant to support students’ scholarly projects. Open to students in any discipline, the SURF grant funds the stipends and project costs for 30 undergraduates every summer. As part of the URCA program, SURF grant recipients must work with a faculty mentor, give a presentation of their project at the end of the summer and continue their research with their faculty mentor the following semester. “The mentoring experience is a huge part of this,” says Meyer-Bernstein, noting that this year the SURF program was able to fund two additional students thanks to Greg Padgett ’79, who made the first significant private donation to the College of Charleston URCA Fund. “It’s my hope that this gift will stimulate more people to donate to the URCA Fund and to value this experience that students are getting,” says Padgett. Meyer-Bernstein chose Ferrelli and Huebsch as the recipients of Padgett’s gift based not only on the outstanding quality of their project proposals, but also on the exceptional mentoring record of their faculty advisors. That value is certainly not lost on Ferrelli, whose project, “Developing the Scene Design Process,” allowed her to collaborate with not just her mentor from the theatre faculty, Charlie Calvert, but also with the production staff at the Shakespeare Theatre of New Jersey. That’s not an uncommon result of SURF. It’s a revelation that Huebsch is grateful to have had so early in his college career. Now that their research projects have led them down that path, both Ferrelli and Huebsch have discovered some pretty big things. Indeed, when it comes to research, you never know what else you’re going to find.